Jan: Why did you begin to study the Celluloid Ceiling, Martha? Jan: And when you say “we,” you mean that you have a team that is working with you? Martha: I always involve graduate students in these projects. I train them to do content analysis. It’s very detailed and time-intensive work. A colleague, David Dozier, conducts the data analysis. Jan: Did you look at all 250 films on your list from the content perspective? Martha: We looked at the 250 top grossing films of 2002 for our “behind-the-scenes” analysis (who directed? who wrote the screenplay? who was the editor? etc). But for “on-screen” content, we only looked at the top 100 films. The top 250 was simply not feasible. It would have required a huge chunk of money. Jan: Have you been getting any grants to do this research? Martha: We have from time-to-time. There have been organizations that have financially supported our research. But in general, the research is self-funded. There just isn’t much funding out there to look at the representation of women in film. I think that what people don’t understand is this: if you change media messages, you change the world. What we see here doesn’t stay here because we export so many films around the world. So you don’t just change things here in the United States, you change the world. I just don’t think enough people make the connection. Jan: What exactly does your research show? Martha: My research clearly shows that if you have women working behind-the-scenes on a film (as producers, directors, screenwriters, etc), you get more female characters on screen. It is a statistically significant and consistent finding over the years. In 2002, in our on-screen content analysis, we also looked at leadership and goal-oriented behavior – what characters were trying to achieve over the course of a film. A “goal” can be a romance, or getting a job, or whatever. It’s pretty cut and dry. We looked at characters who had goals versus characters who had no goals. And then we also looked at whether characters were effective or not in achieving their goals. All of those were “counts,” all of our results were quantitative. There were no “opinions” expressed in the 2002 report. The focus of our 2002 study was really women’s participation and performance in the public sphere. There have been a few other studies that have addressed bits and pieces of this in their research. For example, someone might look at effectiveness: did a character achieve his or her goal? But I don’t think that anyone else has ever put together all of the dimensions we considered (e.g., occupational status, leadership, presence of goals, effectiveness) and tried to get a full statistical picture of how female characters have been portrayed in recent films. If we had more money we could do on-screen content analysis every year. But in the absence of additional funding, I don’t know when we will analyze on-screen content again. It was a huge undertaking. Jan: Tell us a bit about your methodology, Martha. Why is it so important for people to understand how quantitative it is? Martha: When we do this kind of research, we have to expect that some people are going to want to poke holes in it. So we have to have all of our ducks in a row, and we have to be able to defend the research in scientific terms. One thing we calculate is something called “inter-coder reliability.” That means that two different coders view approximately 10 percent of the sample to insure that, in fact, they are coding what is on-screen in similar ways. We want to make sure the coding doesn’t reflect some personal bias that the rater has, or that a coder is seeing something that doesn’t exist. There are certain levels of inter-coder reliability that a researcher has to achieve in order to make statements about the data. And our study achieves these levels. So what we publish is not an expression of opinion; it is a quantitative study that uses all of the statistical conventions that are required of any responsible social scientist. Jan: So how have things changed in the 10 years since you started this line of research? Have you seen any improvements? Martha: Honestly, I would say that there has been virtually no movement over the last 5 years. If you look over the last 10 years, you will see some improvement in the overall percentage of women working behind-the-scenes (taking all of the job categories we look at combined). But any increase in that overall percentage would be due to women’s presence in just one category, that is, as producers. Jan: How do you account for the fact that having more women producers hasn’t had a more beneficial effect on the number of women hired in other roles? Martha: I think it would be naive to assume that the employment of one woman producer on a film can help to change all of the other roles on that film. Frankly, in Hollywood, “feminism” is a four-letter word. People are very careful about their relationships. They don’t want to be labeled as “troublemakers.” So I have to say I think it’s remarkable that when we conduct these studies every year, we find that if you have a woman in a position to hire, you do find more women working in those other behind-the-scenes roles. Jan: How has your own work been received? Martha: I think that many of the female filmmakers I speak with are very happy to have our numbers circulating on an annual basis. However I would say that the institutional response to our research (from the studios) has been quite different. Our research is perceived as being critical of what they do. Their defenses are immediately up when they see this stuff. And I have also encountered something that I call “the privilege of denial.” Sometimes, when individuals who hold powerful positions in the Hollywood community encounter world views that don’t jibe with their own, they simply deny that the situation in question exists. It happens in private settings frequently. Sometimes it even happens in public (for example at conferences, etc). Our research keeps people who are in decision-making positions informed about the current state of women’s representation in film. Jan: What about mainstream women’s organizations? Should they be paying more attention to the Celluloid Ceiling? Martha: As I said earlier, if you can change women’s representation in the media, you will change women’s place in the world. I think it’s that simple. But if change comes, it will come slowly. The political right in this country has been very successful in stifling the feminist agenda. They have been very successful in suggesting that everything is okay now, and we don’t need to worry about things like gender discrimination because all of that has been taken care of. For contrast, let’s look at the NAACP. They formed a coalition a couple of years ago. They were very vocal about the under-representation of minorities in prime time television. And once every three weeks, it seemed, there was an article in the LA TIMES chastising the networks, and basically embarrassing them into taking some kind of action, even if it was just window dressing. That is the only way change happens. 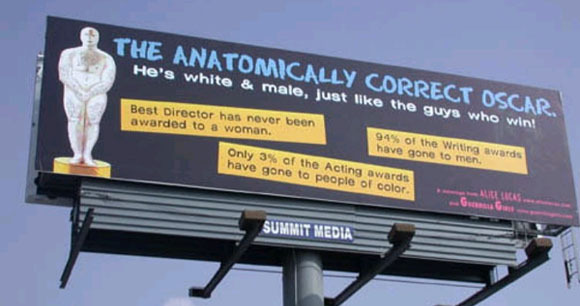 So it appears that Hollywood can be embarrassed about race. People don’t want to be called racists, but they don’t really mind being called sexist. Martha: Where is the voice of women regarding media representation? If you are talking about racial diversity, you have the NAACP. Who do women have? The fact is that there a number of organizations in Los Angeles doing really great work on behalf of women, like WOMEN IN FILM, and the women’s committees at the Writer’s Guild and at the Director’s Guild. But they’re afraid of rocking the boat. They’re afraid of stepping on too many toes. Martha: Right. But if you change media messages, you change the world. People don’t always get the connection because it seems frivolous. And when the question is posed to the big power players in Hollywood, their “out” is to say: “Well, it’s only entertainment.” But we know that it’s not just entertainment. People don’t directly copy the behavior that they see modeled in the movies, but it does have an effect. The effect may be fuzzy, but nevertheless it’s important and powerful. Dr. Martha M. Lauzen, a Professor in the School of Communication at San Diego State University in California, is a prominent national “go to” person on the subject of women in the media. She received her B.A. and M.A. degrees from the University of Iowa, and she holds a Ph.D. in Public Communication from the University of Maryland. She conducts academic and industry research on the role of women in television and film. The findings of her annual studies have been featured in trade publications as well as the popular press, and she has authored numerous articles which have appeared in well-known academic journals. FILMS FOR TWO applauds Professor Lauzen’s ground-breaking research, and we urge all of you to do your part, as viewers (that is, as “consumers of Hollywood product”), to support parity between men and women in the entertainment business. Remember: if we change media messages, we change the world! Read the original post from the FF2 Media archives HERE.